In case you were planning to smoke crack and pass out naked on a river bank in Orlando this weekend, I wanted to warn you that it is a bad, bad, bad idea (borderline Tara-ble, but just shy). 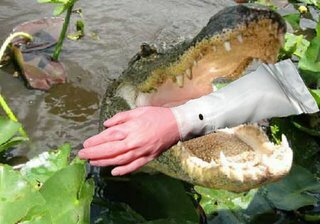 I know it is a bad idea because Adrian Apgar tried it on Wednesday and an “unusually large” alligator tore his arm off. Actually, it kind of gnawed on his arm for awhile, rescuers “tug of warring” him out of the gator’s mouth are responsible for the actual amputation. If you go online, you can hear the audio of the 911 call that Good Samaritan Carlos Mayid made after hearing Apgar’s screams for help. I’ve decided it would be tacky to post it here (it is on the right). There's a rumor going around down here that Mr. Apgar's high also included the dilusion that he was interested in said alligator "romantically" (if you know what I mean). Say no to drugs. Side note: Will and I went (bike) riding in Shark Valley National Park yesterday. Shark Valley has no sharks, but rather has a 15 mile paved path through the Everglades - and no cars allowed. It is part of Everglades National Park. Some of you may have seen old pics of our adventurous rides. Well, yesterday the park was as "alive" as we've ever seen it. For the first time (in the year that we've been riding out there) we saw some gators up and walking around on the path. We see them laying around all the time, but man this was some kinda action. Lots of birds fishing, etc., etc., but that is in no was as entertaining as our four legged reptilian friends. Back on track. I am sharing this, not to exhibit how crazy south Florida can make a person, but rather to show that alligators and people can mix fairly well (if you substitute bicycles for drugs). Yes, the two can mix well, as long as the Gators are used for belts, shoes, and tasteful handbags. Gris, you keep talking like that and you are going to wind up a character in a Carl Hiassen novel. Better a Carl Hiassan novel than one penned by the GTB's most frequently mentioned fiction writer Ann Coulter. You, me, and the rest of the GTB's frequent contirbutors are already subjects of her books. Please find in the index "scum, Liberal". That crazy Harpy. I wish she'd try and hump an Aligator. BTW, Salon had a facinating/terifying article today about the explosion of STD/AIDS in the U.S. population over 70. Since you live in God's Waiting Room, I thought you might find it interesting.